Linden Homes are ready-to-move-in homes in themed communities that are available only to premium account members. Premium account holders can get a free Linden Home, in addition to the other benefits of premium membership. For more information, see Premium membership. Traditional suburban homes are arranged along tree-lined streets on 1024 sq m parcels. The homes are one and two-story buildings with shingle roofs, and in most models, a porch or patio area. A typical home has a two or more large rooms on the main floor and may have one or two upstairs. As described in a later section of this guide, you may use the House Controller on your parcel to choose among the styles pictured here, and you may use the house controller to change colors and details both inside and on the outside of the house. A traditional home is set back from the sidewalk and may have a hedge, a wall, or a low fence to set it apart from its neighbors. You may add to the planting or other landscaping elements on the parcel . Traditional homes are all within a convenient distance from communal park areas where you can join your friends for picnics, sports, or family activities. Some communal areas offer a dining or dance area, or a pool where you can relax. With a houseboat home, you can enjoy life in coves and inlets around the perimeter of the continent or the large nearby island, or along rivers or around the large bay in the center of the continent. You cannot travel on a houseboat, but each houseboat parcel has room for you to moor your own sailboat or other watercraft. All water areas around the New Linden Homes continent are navigable and public. The houseboat models have large rooms with a high ceiling and skylighting, plus a deck area outside for you to relax or entertain on. Most houseboats are on 16 m x 64 m water parcels. Some are on square 32 m x 32 m parcels. Therefore, all have an area of 1024 sq m. All are accessible by open water. You may also walk easily from one place to another, along wooden docks that divide the parcels, or along sandbars and spits from the mainland. Houseboats are all within convenient reach of community areas and cultural venues (lighthouses, beaches, and community buildings where you may gather with friends). First-generation Linden Homes have a land capacity of 117 on a 512 m2 parcel. Touch entry - Left-click the front door to enter and exit your home. Touch lighting - Click the lights to toggle them on and off. Working fireplace - Click the fireplace to toggle a fire on and off. You'll also get a control panel that enables you to manage your home accessories and to change the textures used in your home. For more information, see Using the control panel. 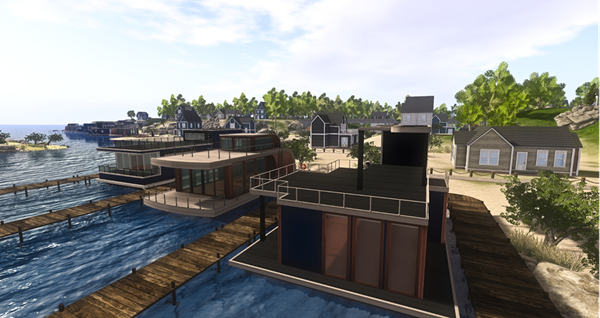 You can get a Linden Home when you sign up for a premium account, upgrade your basic account to premium, or if you already have a premium account and have not claimed your Linden Home yet. If you have a premium account and you have 512m2 available tier then you qualify for a Linden Home. For example, if you have a new premium account — you've just joined Second Life as a premium account or upgraded from a basic account — and haven't changed your land usage, then you have exactly 1024m2 of available tier. Note: You don't have to use your premium account 1024m2 land tier for a Linden Home. You can use it instead towards other mainland purchases or you can contribute it to group tier allocations. Also, if you abandon your Linden Home, you can use your 1024m2 tier to buy other mainland parcels. Inworld: From the Viewer menus, choose World > My land holdings.... Your available land tier is listed in Available for land purchases. On the left side of the page, click Account Summary. Available square meters for purchase at your current tier is listed under Available for purchase. The Linden Home registration process offers options for theme, home type, and home name. Once you submit your registration, your selected home is immediately generated on the next available parcel within your selected theme. You cannot request a specific region or parcel location. Upgrade to premium as prompted. Go to Linden Home registration and log in with your Second Life account and password. Go to Premium Membership registration and log in with your Second Life account. Follow the account upgrade process. Once your account is upgraded to Premium Membership, the page will redirect to Linden Home registration. View the four themed communities and home options within each theme. Click on your preferred home image. Read the Terms and Conditions and check the box agreeing to them. Review your Linden Home information on the confirmation page. Click Go to your Home or use the SLurl provided. Note: Confirmation is sent to the email address you provided to register your Second Life account. If you didn't receive your email confirmation, be sure to check your email application's spam folder. It's also possible there has been an error in the email process, and your Linden Home is ready and waiting for you. If your Linden Home is ready, a landmark is sent to you inworld. If there appears to be such a problem, head to the Support Portal and submit a ticket. Identify whether the email did not go through and your home is actually available, or whether there was a problem with the registration process overall. Log in using your Second Life username and password. Go to your Account Dashboard. On the left, click Land Manager. Look for the name of the Linden Home that you chose when you registered. Click the link in theLocation column to teleport there. 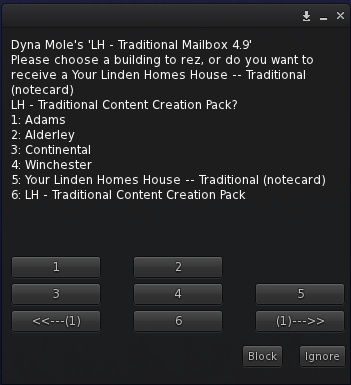 Select the parcel that matches your chosen Linden Home name. You will be teleported to your Linden Home. To change your choice of Linden Home type, you must abandon your current Linden Home and then register for a new one. Choose World > About Land and click the General tab. After you confirm your choice, the land is removed from your account. Now if you wish, you can register for another Linden Home. Warning: Please use this reasonably: if you abandon and choose a new Linden Home five times in 24 hours, you are temporarily blocked from choosing another. You will need to wait 24 hours before registering again. Decorate your home with furniture or other items from Second Life Marketplace. Your partner or friends can help you decorate as well. 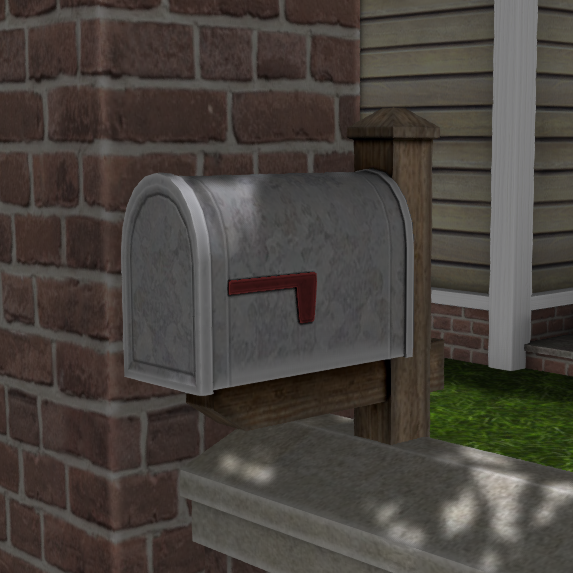 Linden Home parcels work just like any other parcel of land in that regard; who can rez objects on your land depends on the About Land settings. See Managing land for more information. 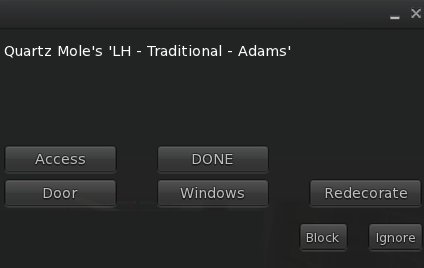 Customize textures used in your Linden Home via the control panel. See Using the control panel. The covenant describes how you can use Linden Home land. To view the covenant, choose World > Region / Estate, then click the Covenant tab or right-click on the ground and choose About Land then click on the COVENANT tab. Terraform Linden Home land, sell it, deed it to a group, join it with another parcel, or divide the land. Modify the structure. For example, you can not move or eliminate individual components of your Linden Home such as the fireplace or a window. Move or rotate the structure. Your Linden Home must remain as it came on its 512m2 parcel. If you want both a Linden Home and more land for your premium account, you can use your remaining tier and/or upgrade on the Land Use Fees page. Tip: Linden Home land can't be group-owned. But if your personal Resident account is eligible for Linden Home land, you can set the land to a group to collaborate with other group members. Is for residential use only. Business use of any kind is prohibited, including parcel rental, rental boxes, classified ads or other forms of advertising, and event listings. Will be kept presentable and in-theme. Does not include traffic tracking. 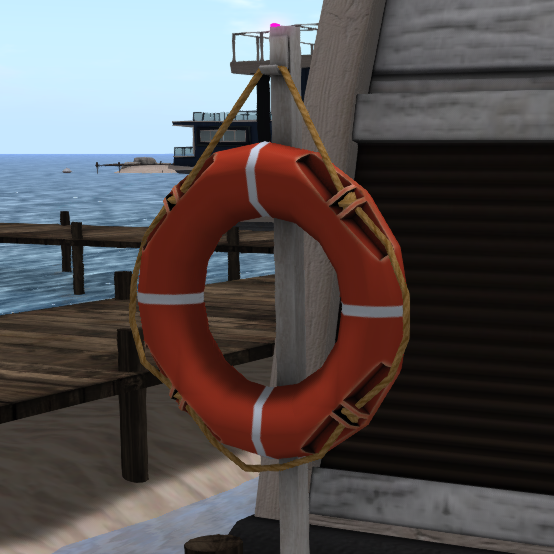 Land cannot contain sky boxes, temporary object rezzers, or individual prims beyond the maximum size allowed by the Second Life Viewer build tools. Use local chat say, rather than shout. Adhere to the maturity rating for the Linden Home region you are in. Review general Second Life etiquette suggestions and incorporate them into your Linden Home experience. Each Linden Homes parcel is equipped with a House Controller like the one shown here. It is just outside the parcel boundary, often near a street or sidewalk or on the dock next to a houseboat parcel. Yours may look like a mailbox or some other marker appropriate to the neighborhood. A House Controller is your tool for selecting the specific model of home you want to erect on the parcel. To use it, simply left-click on it. The House Controller will only respond if you are the current owner of the parcel. It will not respond to guests, friends, or strangers. Choose a home from one of the available models by clicking one of the numbered buttons. Your new home will appear near the center of the parcel, replacing whichever home was there before. 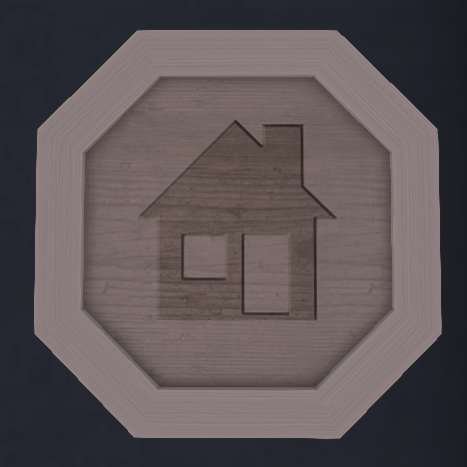 You cannot rotate the home or move it to another spot on the parcel. Linden Homes are always rezzed with the front door facing the House Controller. You may replace the model on your parcel at any time. Homes within a theme all fit in the same parcel area, so they will not interfere with vegetation, fencing, or other objects that Linden Lab has placed on land next to your parcel. However, because each model has a different floor plan, you will usually need to move furniture or other items that you have placed in a previous home so that it is arranged well in your new home. If you select the notecard option, you will receive an instructional notecard. It will explain the features of your house in greater detail than they are covered in this guide. If you select the Content Creation Pack option, you will receive a folder of items that you may use to landscape your parcel and decorate your home. As you enter a Linden Home, you will find a Control Panel just inside the front door. The control panel is your tool for customizing the appearance of your home and for controlling access. The layout of menu buttons for a Control Panel varies slightly from one theme to another, but all Linden Homes have the same basic set of functions described here. When you make most changes with the Control Panel, you receive confirmation in chat. A notice appears within a few seconds to tell you that the new information has been recorded in the system. The Door button offers you a choice between allowing your doors to Stay Open when you click on them, or to AutoClose within ten seconds after they are opened. The Windows button on the main menu toggles the window covering (blinds) up or down. Using this button in the Control Panel toggles all windows in the house at once, so that they are all either up or down at the same time. If you (or a person you have granted access to) want to raise or lower a single window covering, you can do that by simply left-clicking on the window covering (Note: Some house models also offer the option to open and close individual windows. Where that option is available, it is not managed in the Control Panel. To open a window, you just left-click on it). The Access button, which is only visible to you as the parcel owner, will let you give additional people permission to use the Control Panel menus. Using its Add Name menu option, you create a whitelist and add anyone you choose. The person does not need to belong to a special group. You may remove the person’s access permission at any time by clicking this same Access button and using the Remove Name option. If you have created a whitelist, you may check to see who is on it by using the View List option. ONLY ME is the highest level. If you click that menu button, nobody else may use the Control Panel, operate the window blinds, or open doors. LIST is the middle level. If you have created a whitelist, selecting LIST gives people on the list permission to operate window and door functions, and most functions in the Control Panel (but not the Access functions). ANYONE is the lowest level. If you click that button, anybody may open doors or operate the blinds. Only you and people on the whitelist may use the Control Panel. Please note that the Access menu does not control permission to rez objects in your home, or change its music stream. 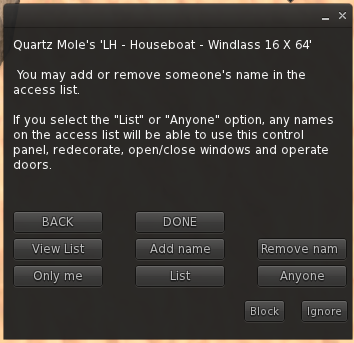 Manage those permissions by creating a group for your home, as discussed later in this guide. The Redecorate button offers options which are different in each home theme, although some features are found in all themes. The Outside button offers different color schemes for painting the siding on the home. The Wall button lets you change the color of the walls inside your home. The Floor button lets you choose among options for flooring inside the home, so you may opt for carpeting or different types of wood flooring. 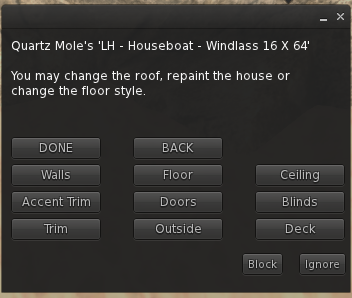 Submenu buttons on some themed homes include options for changing the color of the Roof, Trim, Deck, or other parts of the home that are special for that theme. Most menus in your Control Panel also contain two other buttons. The Done button closes the Control Panel menus and saves your most recent changes in the system’s memory. The Back button opens the previous dialog menu. As a homeowner, you may want to personalize your parcel by adding vegetation, pathways, rocks, or other decorative items. Please remember to stay within the theme of your neighborhood. For more specific details, refer to the covenant in World > About Land when you are standing in your parcel. As an aid, your Linden Home comes with a free Content Creation Pack. In it, you will find items that you may use to spruce up your home/parcel -- items such as decor items, textures, wall/fence kits and lighting may be included. Unlike the house itself, which does not add to the Land Impact on your parcel, these extra objects and anything else that you rez will add land impact, so be careful to stay within your limit. Refer to World > About Land > Objects to verify your available land impact. You may receive the Content Creation Pack by clicking on the appropriate menu option in your House Controller. Texture packs with the building textures for each first-generation Linden Home theme are available at the Linden Home infohubs. Resale of textures is prohibited. Go to the Support Portal and choose Submit a Support Case. Select Land and Region from the first dropdown menu. Select Linden Home Issues from the second dropdown menu. Fill out the required fields; make sure to include as much relevant information as possible when describing your issue. Click Submit to submit your ticket. Go to the Support Portal. Click Submit a Support Case form. Fill in the rest of the required fields.